I find it a little amusing that there are people who are afraid of 93/94 and similar formats because there are control decks that can defeat you without even having to devote space to creatures – Mishra’s Factory and the like – yet don’t blink at cards like Celestial Colonnade. I suppose it’s all what you’re used to! The Worldwake cycle of creature dual lands is probably a little stronger than the Battle for Zendikar cycle, as they have better combat stats as creatures at the cost of being a little more expensive to use (counting Lavaclaw Reaches’ “firebreathing” ability). They tend to become threats at a good time for midrange or control decks, when you’re either at the peak of a string of must-answer cards that are overwhelming your opponent’s defenses or answering just enough of the opponent’s threats to take the metaphorical high ground. I also think it’s kind of cool that Celestial Colonnade’s stats seem to reference Serra Angel, the original white-blue control finisher who is still a staple in 93/94. 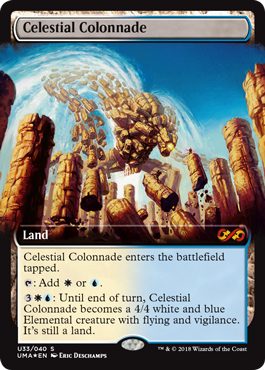 Of the Worldwake creature lands, Celestial Colonnade has been one of the stars of the cycle, because a 4/4 with flying is a great way to end games. In particular, the Colonnade ticks boxes that a lot of slower decks would be happy to tick. It’s resistant to sorcery-speed removal, it flies, it taps for mana until it’s time to go for the kill, and it also can block if need be (and it leaves up mana for other answers, owing to it having vigilance). An evasive 4/4 represents a very efficient clock with which one can end the game, and it’s long been the weapon of choice for control decks in Modern that run Azorius colors. It maybe is a dodgy top deck if your board state is questionable, and there are decks where it can’t strike with impunity, but it’s definitely a powerful piece in any control deck that wants to win at their own pace.